Time passes by so fast when I watch ‘Surplus Princess’ and it truly makes me sad that we only get one episode per week. Just one which is obviously not enough. TvN is so cruel for doing this to us, lol. Cruel TvN! First was deciding to not air any of ‘My Secret Hotel’ this week and then only airing one episode of ‘Surplus Princess’ every week. That stuff hurts ya know? Episode six was just as good as the other episodes and did not fail to deliver with the comedy relief and laughter that we got from the episodes prior. We got to know a little bit more about our male lead Hyun Myung and his adorable and special relationship with his grandmother whom he loves very much, within this episode. We also got to witness the shallow levels that Jin Ah would go to just to arouse jealousy and hate, but on the bright side, we also saw a new and surprising relationship form between two living mates from the boarding house in what originally had started with just one friend helping out another friend into a misunderstanding which then lead to developed feelings. Overall, I was content (like usual). I’m glad the drama focused a bit more on our male lead Hyun Myung other than the fact that he’s unemployed and is a job hunter who lives under a boarding house with a few other awesome friends. We are familiar with the news that some people are embarrassed of him because he doesn’t have a job, but to see someone other than his house mates not criticize him for being unemployed and not look down on him is something that we are totally not familiar with. Kind and sweet Grandma is in support of her grandson regardless of whether he has a job or not and it’s so heart-breaking to see the one person that mattered to Hyun Myung the most and supported him the most leave him. Although while I do think the whole grandma thing was out of the blue and sort of random (I wished we could have touched upon the plot with Grandma a little bit each episode so that what we witnessed in episode six would be a bit more understandable and smooth), I’m glad that we got to see some other people support Hyun Myung because that’s what he needs the most. The drama also manages to tug at our heartstrings again with Hyun Myung’s guilty statement towards the very end of this episode where he cried that he wasn’t even able to do anything for his Grandma. Just like how Ji Yong’s confession about his life in episode five moved the hearts of many, Hyun Myung’s confession in this episode also did the same and that’s what I really appreciate about ‘Surplus Princess’ (and tvN dramas in general where the drama is a rom-com so it’s filled with many hilarious scenes, but every once in a while, it’ll give us a very touching, emotional, and heart-felt scene that leaves you dwelling in awe and content). It’s rare to find dramas that have that same ability so bonus points to the writer and cast of ‘Surplus Princess’ for being able to do that so successfully. I don’t even want to go into discussion about the desperate measures Jin Ah took just to make Ha Ni jealous. It was very low of her to do that and I wish she could take some lessons on how to be mature and adult-like. Heck, she already is an adult, but she remains very childish and immature. Shi Kyung already very clearly explained to her as well that he had no feelings for her like how she does for him, but yet she is going to keep pursuing after him. Granted, it’s going to take some time to get over someone you really wanted, but enough is enough and there are certain boundaries that cannot be crossed or pushed. Jin Ah is certainly pushing those boundaries and crossed them in this episode. Just stop please, Jin Ah. For the sake of your own good and other’s. I know that I’ve been complimenting and speaking positively about ‘Surplus Princess’ and the drama does deserve lots of love and support because it never fails to bring a smile on your face or for you to laugh to the point where your stomach is hurting like heck, but if I had to choose something about this drama that irks me, it would be its inability to build upon the relationships, particularly Ha Ni and Shi Kyung’s as well as Ha Ni’s and Hyun Myung. It failed to build and establish a foundation on those relationships so then we get scenes of Ha Ni and Shi Kyung spending time together or of Ha Ni consoling Hyun Myung when you don’t expect it or you don’t understand how that came to be. I can’t comprehend why Shi Kyung would be so interested in Ha Ni when all she’s shown to him is to be a pretty obsessed and wild fangirl who exclaimed that she was going to make him her true love (or somewhere around those lines). What else is there to Ha Ni that he is attracted to? Is he really that interested in her because she could possibly be the woman he kissed under the sea? Just when and how did he become interested in her? I mean, don’t get me wrong. I like Ha Ni; I think she’s charming and sweet and very adorable, but Shi Kyung just started to like her out of no where without really getting to know her first and that’s what makes me puzzled. I wished the drama could touch upon those things because us viewers are getting thrown at multiple scenes of Ha Ni with both guys, but it’s hard to support them and enjoy their interactions when you’re so clueless as to where or how it started. Another thing as well about ‘Surplus Princess’ that I wish it would focus on is whether it’s going to give us Ha Ni and Shi Kyung right now or Ha Ni’s relationship with Hyun Myung. I don’t like how we’re six episodes in and our two leads have had yet to have any actual and real interactions other than the minimal times they meet or hang out in the boarding house or the first time they met each other. It’s like the drama is trying to balance both relationships at the same time because in episode six we saw Ha Ni hanging out with Shi Kyung and helping him cook and judge food and whatever, but you also saw at the very end Ha Ni caressing and caring for Hyun Myung. Which couple is ‘Surplus Princess’ going to go with? That’s what I want to find out. I’m tired of seeing Ha Ni with both guys, because we know that she likes Shi Kyung, but that she’s going to eventually somehow fall in love with Hyun Myung and get with him. Furthermore, she only has eyes for Shi Kyung but then her view on Hyun Myung has changed for the better after he stood up for her at the end of episode four so it’s like she’s open to both guys, but that’s the thing that I personally don’t like. I would prefer if the drama focused on Ha Ni and Shi Kyung first (but then again their relationship was not well established so it’s hard to like them) and then transfer over to Ha Ni and Hyun Myung smoothly and in a comprehensible way. I think the major thing that contributed to this flaw was once again the drama’s failure to establish and build upon their relationships because if we had witnessed Ha Ni doing things for Shi Kyung that made him see her in a new perspective other than shouting his name excitedly every time she saw him or telling him random things about her, I would understand and go with the flow. But we didn’t so now the drama is going to focus on two couples at the same time which is not working effectively for the drama. I did feel like Grandma’s story was just a plot device to bring our two leads closer together, but at the same time maybe I’m just overthinking everything and overreacting. Maybe what we saw at the very end of episode six was exactly what it just was. Two friends living under the same boarding house giving each other the comfort and support that they both truly needed, especially at that very moment because they both suffered broken hearts. I did like the ending though with Hyun Myung and Ha Ni together where Hyun Myung was in Ha Ni’s arms because it just showed to us the similar situations that the both of them were in. Hyun Myung might not have gotten his heart broken because of romance at that time, but he was depressed and heart-broken because of his Grandma’s death and so was Ha Ni who was heart-broken because she overheard Shi Kyung’s take on his relationship rumor with Jin Ah. At the very end of the day, Ha Ni and Hyun Myung are going through some tough times and when they have no one else to go to, they go to each other and what’s more powerful than two friends giving each other their time and support when life throws at you unexpected obstacles and problems? 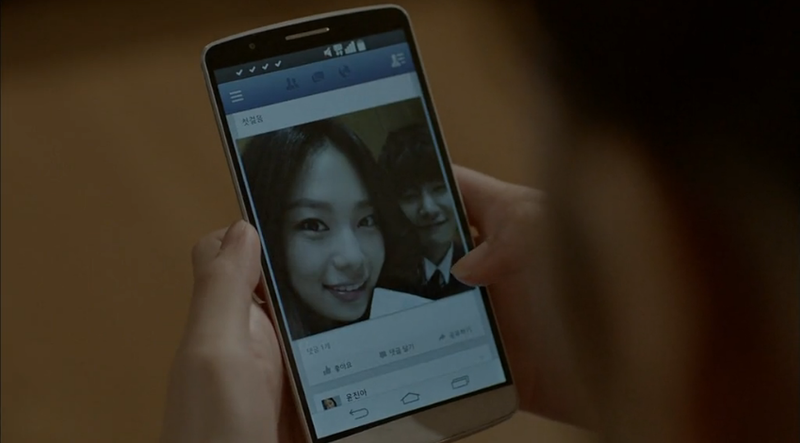 So with that, Ha Ni and Hyun Myung ship. All. The. Way.